Itty bitty banana munches! I die. 1) It's FRIDAY. Aw yeeeah. High five!! 3) The nice people at Instructables asked me to join their site and submit my penny desk for their furniture challenge contest, so yesterday I finally did, and today they featured it! MY FIRST EVER INSTRUCTABLE! Woot! 'Course, now I'm anxiously watching the comments for someone to tell me I screwed it all up and I'm an idiot. Heh. 4) As I mentioned on FB, I decided to start an Epbot Pinterest board since I'm spending [mumblemumble] hours there a day anyway. It's been fun going back through all the projects and tutorials on this blog - so much stuff I'd forgotten! Anyway, for some reason my flip-flop hangers are INSANELY popular over there. As in, everything I've put up has maybe 3 or 4 "repins." The hangers? Seven hundred and sixteen. I don't understand it. But I'm not complaining. I'm going to say it's because the amount of "cute" or "girly" crafts on Pinterest approach insane numbers. Never have I seen so many cake pop tutorials. Never. It's such a great way to organize costume and inspiration boards. Those flip flop hangers are freaking awesome. I made several dozen and gave them as gifts. Seriously smart stuff. I've been on Pinterest for a while now, and I see the hangers at LEAST once a week. Same is true for the penny desk. That porcupine just nibbled out my heart. Where do i get one? You know, I've been hearing about Pinterest quite a bit recently, but I hadn't really been interested in joining up. Sounded like another fad site to me. Now that you are on there Jen, I actually went over and took a look. I think I'm going to be creating an account. And it is all your fault! I always leave Pinterest craving chocolate. I've never seen such a collection of drool worthy desserts. Mmmmmm chocolate. One of my friends repinned the flip flop hangers, and, after a minute, I realized they were yours! Love the Epbot pinterest! Did you know that a baby porcupine is called a porcupette? ...Also, you have lured me to Pinterest. My free time once more belongs to the internet. I have seen the flip flop hangers over and over again in my timeline on pinterest! And I'm always like, "Why do people need to pin this? Do they NOT have Epbot bookmarked?!? Sheesh!" Anyone who posts "you're an idiot" has no understanding of the awesomeness you are. And I'm still getting good vibes off that adorably cute "porkypine." Cute overload! Ooooooh, so glad you've started an EPBOT pinterest board. I missed your Hot Air Balloon Christmas ornament. I LOVE that. As for the flip flop holder, I think it got so many repins because its cool, it's handy, and it's not so complex that it's intimidating. this is OT, but are you going to do a meet up at Megacon? Or, should I just try to find you by memorizing your face via pics? lol. Not trying to be a creep, just a fan and wanting to say hi. @ Stephanie - nothing official, but I'd be delighted to meet any fans there! You can look for me in the afternoons each day, or message me on Twitter & I'll tell you where we are! Psh, people on Pinterest go NUTS for organization. I saw your flip flop hanger on there at least 2 months ago, and I stared at it for a minute going "I know this picture" before I saw the watermark, ha. Thanks, anony - my link had an extra dash in it. Fixed! That is weird; I was just wondering this afternoon if you were on Pinterest! IMHO, you really shouldn't be surprised that something of yours was repinned a bazillion times, what you should be surpised at is the 3 or 4 repins. Everything you do is so fantastic, how could it not be repinned a lot?! I thought I recognized the voice in the video... The porcupet video belongs to Sharon Stiteler, aka Birdchick. http://www.birdchick.com/wp/2007/10/porcupet-sweeping-the-world/ Can you please credit her? Thanks! That little pincusion is *ALL KINDS* of cute! A coworker was going on and on about these flip flop hangers someone found on Pinterest. I checked it out and thought. "Saw that months ago!" They are totally awesome, by the way!! I posted the flops tutorial before I had seen you join, and I got more than 500 repins on that one myself, more than any other thing I've posted. It's crazy! But it solves a need -- if people are like me, they've got a basket full of flops sitting in the corner, and I have to dig through it every time I want to wear a pair! 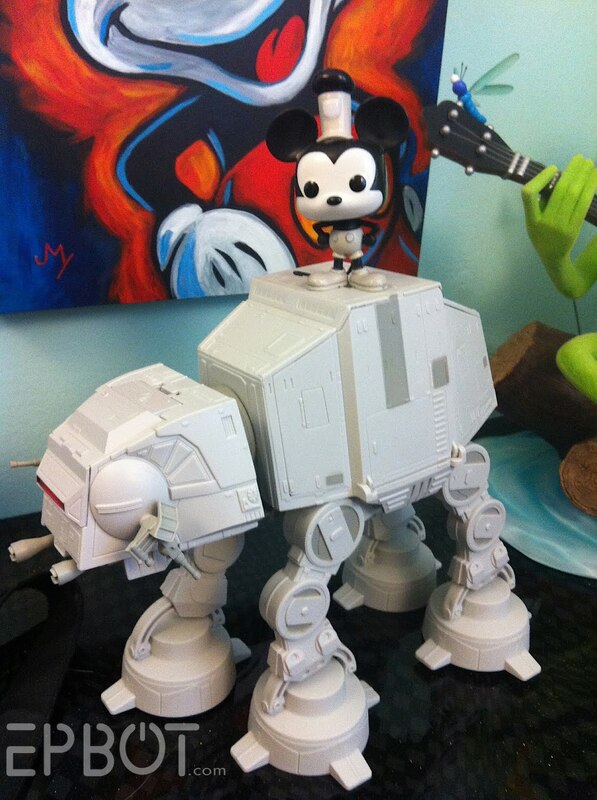 Can I just ask, where on Earth do you get a baby AT-AT because I NEEEEEEEEED one for my work desk! Pleaseeeeeee. Stephanie, we got the AT-AT at Target around Christmas of last year. It's by Galactic Heroes, I think, which also makes cute squished SW figurines. I saw these V-day cookies and thought of you...they are awesome!